We have four sorts of cultivated mint in the garden. 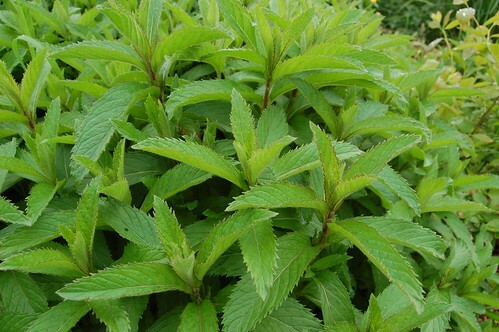 A spearmint that is delicious in tea but is the weakest grower, an apple mint, a dark peppermint that I think was sold to me years ago as "eau de cologne" flavoured and a tremendously vigorous peppermint that can overwhelm comfrey and other mints, it's that strong a grower. We actually nicked a morsel of this from another allotment years ago. They must have been thrilled at the loss because once you have it, it's almost impossible to control. The flavour isn't marvellous but it's strong and minty and insects adore the flowers so it's worth having just for them. Anyway, it's got way out of hand in the bed that I popped it into three years (yes, this is the FOURTH year we've been here!) ago and I've decided it's got to be tamed. I picked eight huge bunches of the stuff today, which are hanging in the loft and with any luck will dry to an aromatic crumble that can be used for tea. The roots will have to be dug out quickly now before they regenerate. I'll plant some in the wilder parts of the garden but I don't think I'll get everything so I'm expecting to have to repeat the exercise sometime in the future. At least the blueberry will get some light to ripen its berries this year, and since Raven has taken to sleeping beneath it the blackbirds will leave some for me.